The necessity of domestic cleaners is said to increase every year, according to various statistics. Regardless of whether you need efficient domestic cleaning in South London, we’re the cleaning company to speak to. People today could be extremely stressful with their work that they don’t have enough time to do the cleaning. This could be seriously discomforting especially if you are waiting for to come to your place. Your visitors will be put off and won’t accept your invite ever again. In addition, living in unclean environment can be very bad for your overall health. If you are worried then you should contact our cleaning company to help you out. But why should you consider our company over the others? Is there really any difference? Of course, there is! Here are some of the main reasons why our company is worth your call. Our cleaning company has highly skilled insured and fully qualified domestic cleaners. We also provide carpet cleaning, window cleaning and upholstery cleaning. We also provide time-saving services which include party help and ironing service. This is perfect for those who are very busy and who want to call only one company to handle all their cleaning needs. Our cleaning costs are very reasonably priced. You don’t have to worry about hidden charges. 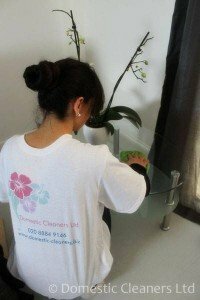 Call or email us today if you have any inquiries regarding our domestic cleaning South London and if you want to hire our impressive domestic cleaners.